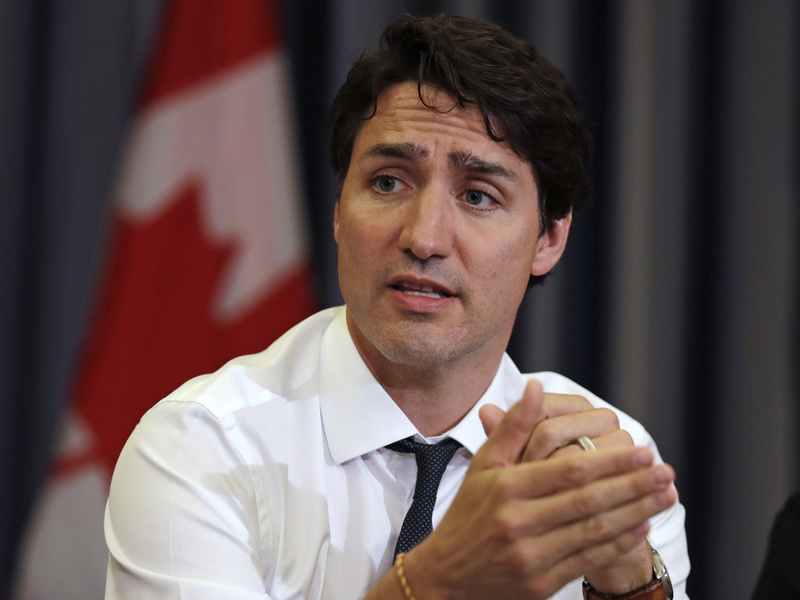 Canadian Prime Minister Justin Trudeau, photographed in May, told reporters on Thursday, "I do not feel that I acted inappropriately in any way but I respect the fact that someone else might have experienced that differently," amid an allegation of groping 18 years ago. The accusation — that he groped a female reporter on assignment — traces back to a music festival which he attended in support of avalanche safety. He joined the cause after his brother Michel died while skiing in 1998. After the fundraiser, an unsigned editorial appeared in a local paper, the Creston Valley Advance, which said that the female reporter had been mistreated by Trudeau. It stated that he apologized for "inappropriately handling" her. He was quoting as saying, "I'm sorry. If I had known you were reporting for a national paper, I never would have been so forward." The editorial resurfaced this spring, to be assessed in the wake of the #MeToo movement. Its contents were republished by an Ottawa magazine, the Post reported. Then it spread to social media after a photograph of the original editorial was tweeted out by Canadian commentator Warren Kinsella. Breitbart, Buzzfeed and other outlets then reported on the allegation. According to the National Post who spoke with two of the reporter's supervisors at the time, the female journalist wrote the editorial. She told the Canadian Broadcasting Corp and other media that she did not want to be named or contacted about the story. Trudeau initially responded to questions about the incident by saying, "I had a good day that day. I don't remember any negative interactions that day at all." But on Thursday he appeared to confirm the apology described in the editorial, telling journalists, "I apologized in the moment." He was quick to deny wrongdoing, adding that, "I do not feel that I acted inappropriately in any way but I respect the fact that someone else might have experienced that differently." The same interaction could be perceived differently by each person involved, he said. "Part of this awakening we're having as a society, a long awaited realization, is that it's not just one side of the story that matters." The liberal leader said he would not speak for the woman — "I would never presume to speak for her" — and that no one on his team had contacted her because they did not think it was appropriate. He added, "I'll be blunt about it. Often a man experiences an interaction as being benign or not inappropriate, and a woman, particularly in a professional context, can experience it differently. And we have to respect that and reflect on that." Brian Bell, editor of the Advance at the time, told CBC that he believed the reporter's account. "I don't recall that the reporter was coming across as having been traumatized or distraught about it, but definitely that, whatever physical touch or whatever had occurred in that moment was definitely not welcome and definitely inappropriate." Valerie Bourne, then the publisher of the paper, told CBC that the reporter was "distressed" by her contact with Trudeau, unsure of "how she should proceed" but that she "would not classify it or qualify it as sexual assault." After the prime minister's remarks, she expressed skepticism to the Post. "To me, he's deflecting. He's basically saying that two people can have a different reaction to the same event. He's got his perception of it and she has hers — and he's not saying that either is wrong." Trudeau did not address reporters' questions about whether he would order an independent investigation into the incident, as he did when members of parliament faced allegations of sexual harassment. He has earned a reputation of being an advocate for women. In 2015, he named an equal number of male and female members in his cabinet. The 2018 federal budget went through a gender-analysis. And he took action against male members of parliament when female counterparts accused them of inappropriate behavior. In a January interview with CBC Radio, Trudeau said he had spent 25 years working on sexual assault-related issues — his activism beginning with outreach at a sexual assault center at McGill University. He said, "There is no context in which someone doesn't have responsibility for things they've done in the past."